We’d love your help. Let us know what’s wrong with this preview of Raising Your Spirited Child by Mary Sheedy Kurcinka. To ask other readers questions about Raising Your Spirited Child, please sign up. how can i read it ? Is is too much of an exaggeration to say this book saved my life? Well, perhaps it is, but in all honesty, this book improved my quality of life and helped me understand my 3 year old's personality. My child is definitely more intense and sensitive than many other children--but now I've learned to value and appreciate her in a new way. I also know how to be an advocate for her in preschool and future school settings. Seriously, I am a better mommy due to the facts and advice found in this book. warning: this review is kind of long because I want to remember certain things before I return this to the library. I have had this book recommended to me by several people but had never read it because I didn't think my kids were "spirited". They aren't hyper, but I was totally misunderstanding the use of the word. The opening page of this books says "I ... secretly needed to talk with other parents who understood what is was like to live with a child who could scream for 45 minutes because his warning: this review is kind of long because I want to remember certain things before I return this to the library. I have had this book recommended to me by several people but had never read it because I didn't think my kids were "spirited". They aren't hyper, but I was totally misunderstanding the use of the word. The opening page of this books says "I ... secretly needed to talk with other parents who understood what is was like to live with a child who could scream for 45 minutes because his toast had been cut in triangles when he was expecting rectangles." That has happened several times in our house so, when I read that, I knew this book was for me. This book helped me understand my children better and gave me a few techniques for dealing with them. I think mostly you have to learn what is best for your own child by trial and error, but this book helped me recognize that a child isn't trying to drive me crazy because she won't wear certain clothes or goes on and on about the scent at the hair place-- she is just extremely sensitive, more so than I am, and now I recognize that. I also found the discussion about introverts and extroverts helpful. Introverts need time on their own to refuel. They need to take a break from people when they have been overstimulated. A lot of it focussed on changing the labels we use to be more positive. For instance one of my children is extremely perceptive. This is a positive trait when it comes to artwork, she remembers details that others do not see. But it becomes a problem when she is so distracted by all the details around her that she doesn't listen to directions. This book recommended a soft touch and eye contact to be sure a child hears you. Send your message in many different ways like writing, demonstrating, pictures, etc. Keep directions simple so they don't get distracted by a list of steps. This is called the Pygmalion Effect and has been well documented by researchers. The reality is that children learn what hey are from others in their lives. Think about ht e spirited children you know. What words do you use to describe them? Do they sound like the million-dollar words created by advertising companies, words that can make you wish you could have even more children who are spirited? Are they the kind of descriptors that would make others envy you the opportunity of raising a spirited child? Tags that create, warm, tender feelings? Labels that make you puff with pride, smile in appreciation, and chuckle with enjoyment? Positive words that focus on what’s right instead of what’s wrong? To be perfectly honest, it’s unlikely. Research has documented it, when we are happy and feeling good about ourselves, we select higher goals, perform better, and persist longer on tasks. And although your child may initially respond with a bit of skepticism, if you keep it up, eventually he will believe your words and become more open to your guidance. Words really do make a difference. It’s easy for a child to build a healthy since of self-esteem when the words used to describe him are the ones like creative, curious, and zestful. Words that create positive images wrap our kids in a protective armor, giving them the strength they need to make the behavior changes that actually turn the inappropriate behavior into acceptable actions. In other words, kids who like themselves, behave themselves. Once children have learned to respond to the cues their bodies are sending them and understand time-out as a healthy opportunity to deal with their stress, they can call for one themselves. In fact, you may see your children slide out of the action and into their room for a quick break all by themselves. Intuitively they are bringing their bodies back into the green zone. This is especially true if you have created a sign with the words “I need a hug,” or “I need your attention” on it that they can hand to a parent when time-out alone isn’t enough to pull the game plan back together. Even three-year-olds can begin to appreciate the power of words instead of tantrums to get their needs met. People yell when they are angry and frustrated. Mind you, I am not advocating yelling, but it is a reality. In some cultural groups it is very acceptable. In others it may not be as widely approved, but it remains a fact of life. We are all aware of the traumas children experience when they lie in their beds listening to their parents screaming at each other, or stand there, powerless victims, as their parents rage at them. This is verbal abuse, which studies over the last three decades have shown can be even more psychologically harmful than the physical assault of punches and kicks. This kind of yelling is not acceptable. Spirited kids are our future politicians, lawyers, salespeople, and agents of change. If we don’t want to spend our time arguing with them every day, we have to be sure our basic ground rules are very clear. Rules describe what behavior you expect. Your family’s rules may not be the same as mine, but what’s important is that there aren’t too many. Spirited kids test every single rule. “Are you sure it’s a rule?” they seem to question. “Is it true that it’s a rule every time? Are you really going to insist I follow it? Do you follow it too?” Rules are your battle lines. The fights you are willing to dig your feet in and be as persistent as your spirted child. 1. Is the behavior safe? 2. Is it respectful of self and others? 3. Is it respectful of the environment? If not, it’s the adult’s job to help the kids stop. When you are very clear about what your rules are and why you have them, you will feel confident. When you insist that your three-year-old take a nap or at least have a rest period, you don’t have to question yourself when he starts to put up a fuss. You know it’s important for him and his safety, since preschoolers who go more than eight hours without sleep are 86 percent more likely to end up in an emergency room with injuries. I always tell parents in my classes that if they ever feel as if they are the only parents in the world with a sensitive spirited child, they should drop everything and head for the largest, noisiest, most congested store in their area. There they will find spirited kids dropping like little bombs: two down in aisle one; three in aisle four (the candy shelf); and six in aisle seven (the toy department). At first glance in will appear that the explosions are triggered by a refusal to buy a candy bar, a desire to push the cart, or some other insignificant issue. The real trigger, however, is hidden in the fluorescent lights, piped-in music, flashing signs, colorful packages, and crush of people that create more stimulation than a sensitive child can endure, especially if his or her energy bank is low. Remember introverts only like to share feelings after they’ve had a chance to think about them. Let them know you’re available when they’re ready to talk, but give them the time and space they need to think through their emotions before you expect them to share them. If you push them, they’ll only withdraw. Introverts need their space. Sensitivity combines with intensity to make spirited kids very tenderhearted. They form deep and lasting relationships. They have a tremendous sense of justice. They are easily hurt. It is critical that they understand both their sensitivity and intensity, to realize that life may have dumped a bucket of water on their head but they aren’t drowning. They will survive. Choosing the right words is critical to winning your child’s cooperation. If you want your child to do something and don’t wish to debate it, be sure your message is a clear direction: “It’s time for bed,” “You may play in the yard,” “It’s time to leave,” “Wash your hands before eating,” “and “The rule is you must wear shoes in school.” These are all straightforward directives. They clearly and simply tell the child exactly what he may do. Make sure you are not unintentionally blurring your direction by adding the words please or okay or even raising your voice at the end of your statement as though asking a question, when there really isn’t any choice. If you don’t want to be hit, bitten, whined at, hung on, or disgusted, you have to teach your children how to get your attention. Decide how you would like them to approach you and then show them. Do you want words? What words? “I want attention,” “I need a hug,” or “Please listen to me.” Do you want actions: a tap on the shoulder or the shaking of your hand? Do you need eye contact? Do you want them to stand in front of you? Do you want them to pull you down to their level and talk to you? There isn’t one right way, but just as you have to learn how to get your child’s attention, your child has to learn how to get yours. Next time he whines, say, “Stop. I’m listening. I think you are telling me you want attention. Say it with words.” Or if she hits you, say, “Stop. Hitting hurts. If you want my attention, take my hand.” Then you have to be willing to garner your forces and give your attention to her. Spirited children adapt slowly to transitions – any transition – because change can easily put them into a state of alert, ready to move into the red zone of fight, flight, or freeze. When the intensity goes up, adaptability goes down. To shift gears, to pass from one activity, place, or topic to another requires a wrenching, grinding effort on their part. Transitions are the virus that can destroy the system. If you can’t even get the kids out the door, in the door, to the table, from the table, or cleaned up without a major hassle, the good parts of the day lose their sparkle. The day feels rotten. Listening to their vehement squeals of protest make you feel that a major overhaul is needed to correct the problem. Fortunately a mere tune-up will do the job. “What if” teaches kids to be good problem solvers and sets them up for success. If the “what if” actually happens, they’re already prepared. They know how they feel, they have words for it, and they know what to do. Even if you haven’t quite guessed the “what if” situation correctly, you’ve probably come close enough to make comparisons. “Doesn’t this raise anxieties?” parents ask me. Potentially it could, but the emphasis of “what if” is not on what terrible disappointment or calamity could happen. The emphasis is on our confidence in their ability to solve the problem. This is a supportive, comforting message. Kids don’t become anxious when they feel in control. Megan Gunnar at the University of Minnesota has found that even infants show elevated levels of stress hormones when their parents are stressed. While all children will respond this way, your spirited child picks it up like a top-of-the-line vacuum. Truly this child is your family’s “emotional barometer.” His spill-over tantrums are a warning sign that can feel overwhelming when you are already at the end of your rope. DEVELOPMENTAL SURGES: Kids go through developmental surges. You can mark it on your calendar. Somewhere around their birthday and their half birthday, you can expect trouble. They get cranky and uncooperative. They might be incapable of doing what they were able to do just a few weeks before. Nothing seems right. They’re easily frustrated. Every time you turn around, they’re crying about something else. They won’t cooperate. They want to be held and then push you away when you hold them. They’re angry – angry at you, at the world, and at themselves. They are more easily upset by anything. The developmental theorists tell us that this is a time of disintegration, a time when children are moving from one stage of development to another. Their inner systems are restructuring, creating a new, more complex way of understanding the world. Ask your kids if they know what the rules in your house are for tantrums. If they don’t know, sit down and talk about them, but choose your discussion time wisely. Select a time when everyone is well rested, cool, calm, and relaxed. Then you can actually have fun with it. Kids as young as three can develop the rules. Go ahead, ask them. It is fascinating what they have to say. If your spirited child is an infant or toddler, know what your rules are and say them out loud so your child will begin to learn them. At our house the rules for tantrums look like this: It’s all right to cry and throw yourself on the bed. You can stomp your feet, yell like Tarzan, and ask to be held. It’s not all right to hit, kick, pinch, scream in someone’s ear, throw things around the room, blame others, spit, scratch, grab or swear. Now think about your child. How long does it take him to prepare for bed and calm his body and his brain so that he’s ready for sleep? Most children will need approximately forty-five minutes to an hour. So if you want your child to be asleep by 8:30, that means bedtime needs to be at 7:30 or 7:45 PM at the latest. There are hordes of books on sleep problems that will encourage you to let you child cry it out. Fortunately, even these authors are beginning to recognize that there is a flaw in this advice. Supposedly the child stops crying after a few minutes. Spirited kids don’t. Left to their own devices, intense, spirited children become overwhelmed by their powerful reactions. They may be unable to stop, crying for hours instead of minutes, not because they are “out to get you” but because of their physiology. They get more upset as the minutes tick away. The bedtime battle is extended instead of being shortened. Oftentimes when I talk with parents who are worried about their child’s social skills, I realize the real issue is understanding the differences between introverts and extroverts. It is important to remember that popularity or social skills cannot be measured by the number of friends your child does or does not have. In chapter 5 I explained how introverts and extroverts interact with others. Introverts are frequently not given full credit for their social skills because they are more selective with their friendships. If you are an extroverted parent, you may worry that your introverted child doesn’t have friends because he is not eager to invite other children over to play. Remember that introverts form deep, long-lasting relationships with a few good friends. Their social skills may be excellent they simply are more particular and take longer to form their relationships. If your child is playing successfully with at least one other child, you probably don’t need to worry. He has social skills, He is just being very selective in how he uses them. Remember, Introverts enjoy and need time alone. Being alone and being lonely are not the same thing to an introvert. Why isn’t it easy to send kids off to school? You’d think we’d be happy – appreciative of the break. And perhaps you are. It is a relief, a milestone. Still, you may find your eyes filling, your vision blurred as soon as your son or daughter mounts the school-bus steps for the first time – alone – or releases your hand and enters that preschool classroom – leaving you behind. She’s on her own to face the world. You gulp, hoping that she will be treasured by those she encounters rather than discussed as an oddity or troublemaker. But you don’t know and you stand there praying that she will be successful, that she will enjoy school, make friends, and bring a smile rather than a frown to her teacher’s face. Spirited kids can prosper in school. You can find them serving as student council leaders, in the starring roles of the school plays, as members of the winning teams, and in the enhanced learning programs. They can be successful in a Montessori school, in a local public school, in a parochial school, or in a private school. They type or location of the school doesn’t really matter. What does matter is that individual differences are respected and that parents, teachers, and kids are working together. In a school where this occurs, you can see, feel, and hear things that let you know spirit blooms here. Read this book and I swear its written about my oldest son! Really helped me understand him and better deal with some of the issues we were having. I completely changed my way of discipline and also changed some of the situations where I realised he would become over stimulated and therefore this would cause problems. Having read this book after a few months of me changing my patterns and the things we did he became a different child. I recommend this to any parent that has a spirited child, it Read this book and I swear its written about my oldest son! Really helped me understand him and better deal with some of the issues we were having. I completely changed my way of discipline and also changed some of the situations where I realised he would become over stimulated and therefore this would cause problems. Having read this book after a few months of me changing my patterns and the things we did he became a different child. I recommend this to any parent that has a spirited child, it described the extrovert, introvert, gives examples of personality types and issues. Great reference book. I cried when I started this book. It was such a relief to know that there were other parents out there like me, with kids like mine! It was validating to know that some children DO require more input than others: I felt like my hard work was finally recognized. As I continued, what stood out, even beyond the helpful advice and tips for handling the intense traits of a spirited child, was her positive perspective. I was able to shed the burden I was feeling about having a "spirited" child and loo I cried when I started this book. It was such a relief to know that there were other parents out there like me, with kids like mine! It was validating to know that some children DO require more input than others: I felt like my hard work was finally recognized. As I continued, what stood out, even beyond the helpful advice and tips for handling the intense traits of a spirited child, was her positive perspective. I was able to shed the burden I was feeling about having a "spirited" child and look at these traits and challenges as a very special gift. A gift yes, but one that definitely requires some fine-tuning. That's where she breaks down her definition of "spirited" into separate temperamental components and what they look like, and then how to respond in a positive way. The practical advice is the meat of the book. Along the way not only did I learn about parenting, but I learned about myself, my childhood, my marriage, and about relationships in general. This book is a rare gem that transformed the way I think. I found this book stunningly useful and reassuring. Kurcinka emphasizes that those larger-than-life size reactions your preschooler are having come from her real reactions to things and that understanding the temperamental sources of some of those reactions (like being slow to adapt to a new situation or being high energy and needing to move) can allow you to handle them better and to facilitate them where you can and redirect them where you can't. While reading Kurcinka's book, I found myself b I found this book stunningly useful and reassuring. Kurcinka emphasizes that those larger-than-life size reactions your preschooler are having come from her real reactions to things and that understanding the temperamental sources of some of those reactions (like being slow to adapt to a new situation or being high energy and needing to move) can allow you to handle them better and to facilitate them where you can and redirect them where you can't. While reading Kurcinka's book, I found myself becoming more sympathetic to my daughter's frustrations and outbursts. The best part, I think, is that Kurcinka allows you the parent to have emotional reactions (even acknowledges that you might be "spirited" too) and encourages (indeed, insists upon) monitoring your own emotional reactions and responding to them (taking a break, for example, when your persistent kid is about to make you explode). In addition, and this seems so smart to me, she encourages you to narrate your process of handling emotions to your child in order to make her process of doing the same thing feel more natural, normal, accepted. It's important to Kurcinka that we talk about children's intensity in positive terms, that we recognize that this emotional receptivity and expressivity can be a major strength in life, and that we overtly (rather than implicitly) teach the process of recognizing and managing these emotions. The book is filled with practical advice that I've been implementing and finding successful since I first started reading it. Best of all, there's no parent-blaming, no "find your inner Zen-master," no "your kid will know if you are faking the authority that you possess." This book is all about recognizing the cues from your child that might signal a big reaction is coming and then encouraging her to be a collaborative problem solver. This idea of "finding the yes"--coming to a conclusion that satisfies all members of the family and not just the parent--is so helpful. My daughter is very intelligent and very strong-willed, and when she sees the steps of decision-making and feels heard, she becomes newly calm in a situation where she might have been gearing up to fly off the handle. Це надзвичайна книга. А надзвичайні діти - це такі, які ніби звичайні, тобто без психічних розладів чи інших важких хвороб, але все ж якісь... складніші. І батьки хапаються за голову - звичайними методами з ними не впораєшся, а "лікувальні" не для них. Або ж дитина б'ється на смерть, аби нікуди не їхат Це надзвичайна книга. А надзвичайні діти - це такі, які ніби звичайні, тобто без психічних розладів чи інших важких хвороб, але все ж якісь... складніші. Або ж дитина б'ється на смерть, аби нікуди не їхати, не йти, ні з ким не зустрічатися. Ця дитина чутлива до змін. Не зараза мала, не прокляття роду людського, а просто чутлива і не вміє дати собі раду з цим. Чи енергійна дитина. Буревій і жертви серед мирного населення. Але ж дитина просто має такий рівень енергії, і питання не в тому, як її приборкати, а як навчити жити з такою енергійністю. Авторка вчить правильному ставленню: як сприймати, як переформульовувати "проблемні" риси в позитивні - не впертість, а завзятість, не вибуховість, а пристрасність. Це гарні риси. Корисні. Маса прийомів, технік і життєвих прикладів щодо всіх ситуацій, в яких батьки просто хапаються за голову чи волають як скажені бегемоти. Як їсти, як спати, як вдягатися, як відпочивати, як розмовляти, як робити все, щоб ви з вашою надзвичайною дитиною жили радісно й мирно. I found a LOT to really like about this book. There were moments when it actually brought me to tears, because what I was reading was, for once, EXACTLY like reading about my kid...and my reactions. In fact, I'm going to make my husband read this because I think there are some really important observations we can use to be better parents for our spunky/spirited child. There are parts of the book that don't apply to us, which I think would be the case for many parents. But what parenting book is I found a LOT to really like about this book. There were moments when it actually brought me to tears, because what I was reading was, for once, EXACTLY like reading about my kid...and my reactions. In fact, I'm going to make my husband read this because I think there are some really important observations we can use to be better parents for our spunky/spirited child. There are parts of the book that don't apply to us, which I think would be the case for many parents. But what parenting book is 100% applicable to every family? Overall, though, I found this book to be one that spoke to me about a kid like mine in ways I found positive and reassuring. I do wish that there were more examples of how to handle discipline, tantrums, etc. The book focuses most of its energy on getting the reader/parent to accept and acknowledge how the temperaments and traits of their child may be causing the conflicts in the home, and less time on how to deal with those conflicts once you know those temperaments. I did read an older version of the book, so perhaps more recent editions have added to this area. This book is fantastic. If you think you have a kid who is More, I can't recommend this one highly enough. Toby has always been an intense child - even in the womb he was a nutball. I was at the end of my rope a few weeks ago and truly did not know what to do with this kid - nothing ever works. No really, nothing I have ever tried discipline wise has ever helped. Except for screaming - we told him if he screamed a bear would eat him. This cut down on 90% of the screaming, but I'm not really want This book is fantastic. If you think you have a kid who is More, I can't recommend this one highly enough. Toby has always been an intense child - even in the womb he was a nutball. I was at the end of my rope a few weeks ago and truly did not know what to do with this kid - nothing ever works. No really, nothing I have ever tried discipline wise has ever helped. Except for screaming - we told him if he screamed a bear would eat him. This cut down on 90% of the screaming, but I'm not really wanting to threaten him with imaginary bears for the rest of his life. I especially love Kurcinka's thoughts on labeling. I am working on changing my own labels of Toby. He's not annoying, he's persistent. ha, ha. I began this with a lot of cynicism, since every other parenting book I'd ever read seemed to be talking about a child quite different than mine. Fortunately, this book made a huge impact on me, my husband, and the way we understand and appreciate our daughter. I only wish I would have read it earlier - it would have prevented a lot of frustration and hurt feelings. I love that the book's premise isn't to "fix" your child - it unapologetically says, "this is who your kid is, you can't change 'em I began this with a lot of cynicism, since every other parenting book I'd ever read seemed to be talking about a child quite different than mine. Fortunately, this book made a huge impact on me, my husband, and the way we understand and appreciate our daughter. I only wish I would have read it earlier - it would have prevented a lot of frustration and hurt feelings. I love that the book's premise isn't to "fix" your child - it unapologetically says, "this is who your kid is, you can't change 'em, so this is how you learn to cope and appreciate them." What a refreshing thought! As an added bonus, I never expected to read a book in order to help me understand my child and, along the way, gain so much understanding of myself! I got my answer in the first chapter of this book when I took a quiz that surprised me. After the quiz to identify whether or not my child was spirited, I was surprised to find a quiz to discover if I was spirited. When I discovered that I am a spirited parent, that was all I needed to know. My child didn't need to change, I needed to to change. Life was completely different after that. Today, my spirited child is a 20 year old American Soldier and a missionary who is the light and joy of my life I got my answer in the first chapter of this book when I took a quiz that surprised me. After the quiz to identify whether or not my child was spirited, I was surprised to find a quiz to discover if I was spirited. When I discovered that I am a spirited parent, that was all I needed to know. My child didn't need to change, I needed to to change. Life was completely different after that. A very verbose tome when I, with my savage (excuse me, energetic) 3 year old, am at the end of my rope trying to understand him, live with him, not sell him on ebay. I wanted the facts laid out for me like boom, boom, boom. I wanted someone to hold my hand and say, "when he does x, you do y." I don't know that there is a book in existence that can do that. However, I'll keep chugging along, reading parenting book after parenting book hoping that someday I am so filled with parenting wisdom that I A very verbose tome when I, with my savage (excuse me, energetic) 3 year old, am at the end of my rope trying to understand him, live with him, not sell him on ebay. Good strategies for all parents. I picked this up after a few friends suggested it. At times we struggle with focusing our son's energy in positive directions and I thought this might be helpful. While I don't think my son falls into the truly "spirited" category, many of the attributes outlined in the book did apply to him and it was good to read a bit more about facets of his personality and temperament. Quite honestly, I didn't learn a whole heck of a lot of new techniques. If anything, the author reassured me that I am alre I picked this up after a few friends suggested it. At times we struggle with focusing our son's energy in positive directions and I thought this might be helpful. While I don't think my son falls into the truly "spirited" category, many of the attributes outlined in the book did apply to him and it was good to read a bit more about facets of his personality and temperament. Quite honestly, I didn't learn a whole heck of a lot of new techniques. If anything, the author reassured me that I am already doing the right things to encourage his positive development. In some ways, I felt victorious in reading this, thinking to myself, "Yep, I do that! Check!" What the book really did was give me a reminder that I need to be more consistent with some of these techniques and to apply them more frequently. Since reading the book, I also find myself taking a moment to regroup when his behavior starts to get under my skin. I stop, remind myself that he is not being pokey, or being contrary just to tick me off...there is something behind it, and, as a parent, it is my job to help him process that. That has helped me to stay calmer, a lot calmer. Kurcinka's writing style makes her tips and techniques accessible to a broad spectrum of parents. She doesn't go into great technical detail. She keeps things simple and clear, and, as such, I would feel comfortable suggesting this book to parents from very diverse backgrounds. Якщо я скажу, що знайшла, нарешті, книгу про виховання, яку радитиму й даруватиму усім знайомим батькам, ви мені повірите? Ні? А даремно! Бо я її таки знайшла, навіть враховуючи увесь мій скептицизм щодо подібної літератури. І якщо "Французьке виховання" Памели Дракермен (мамський хіт позаминулого літа) сприйнявся з багатьма правками стосовно місця, часу, традицій, звичок тощо, то поради американської лікарки-педіатра й відомого тренера з виховання дітей мені особисто як мамі вже стають у приго Якщо я скажу, що знайшла, нарешті, книгу про виховання, яку радитиму й даруватиму усім знайомим батькам, ви мені повірите? Ні? А даремно! Бо я її таки знайшла, навіть враховуючи увесь мій скептицизм щодо подібної літератури. І якщо "Французьке виховання" Памели Дракермен (мамський хіт позаминулого літа) сприйнявся з багатьма правками стосовно місця, часу, традицій, звичок тощо, то поради американської лікарки-педіатра й відомого тренера з виховання дітей мені особисто як мамі вже стають у пригоді практично в повному обсязі. Зізнаюся, спочатку я чомусь вирішила, що мова йтиме про те, як виховати зі звичайної динини надзвичайну. Почавши читати, я запідозрила, що ні – книга про те, що робити з надзвичайними, цебто особливими дітьми. А потім з’ясувалося, що це ж – про мого малюка і про мене! І про подругу та її дітей. І про сестру та її доньку. А ще з’ясувалося, що практично всіх сучасних дітей можна назвати "надзвичайними" – емоційними, чутливими, занадто інтро- чи екстравертивними тощо. І якщо знати про їх особливості й знати, що з цим робити, то життя і дітлахів, і батьків може стати набагато легшим, цікавішим, змістовнішим і, головне, щасливішим. А хіба не всі ми саме цього прагнемо? This book was the most helpful of all behavioral books I've read about my oldest child. I came away with tools, hope and above all a feeling that I can raise a very intense, sensitive, perceptive, persistent & energetic boy...Mark is all these things at one time or another and at times I was at a loss of how to work with it. The way Kurcinka writes was very helpful in breaking down each special trait and I enjoyed the examples tremendously in driving home her points. Wonderful book and one tha This book was the most helpful of all behavioral books I've read about my oldest child. I came away with tools, hope and above all a feeling that I can raise a very intense, sensitive, perceptive, persistent & energetic boy...Mark is all these things at one time or another and at times I was at a loss of how to work with it. This book really helps me see my kids differently and through a less harsh lens. It gives me more empathy for other parents too, kids aren’t textbook and there is no perfect guide, we’re all going to parent our kids the best we can for everyone’s temperament. In this book I found a book that explains my kids to me and I am really encouraged by it. It has sparked good conversations with me and my husband and our family, it’s helping me speak more positively to and about my children. Here's my review from Amazon on this book. This book has been SO WONDERFUL!!!!!!! If your child is spirited, READ IT!!! I'm so grateful for the tools and mindset that this book gave me. I felt punished every day for over a year. "Why did I have to get this child? I don't want this one. Take him back, please!" I also had terrible postpartum depression at the time, which made everything worse than it already was, plus my son had one of the five worst cases of colic I've ever heard of, and I've heard Here's my review from Amazon on this book. I'm so grateful for the tools and mindset that this book gave me. I felt punished every day for over a year. "Why did I have to get this child? I don't want this one. Take him back, please!" I also had terrible postpartum depression at the time, which made everything worse than it already was, plus my son had one of the five worst cases of colic I've ever heard of, and I've heard a LOT of stories of people trying to sympathize but being unable to even imagine the hell we went through in our son's first year. Now, we have a wonderful, curious, passionate, loving, interesting, smart, adorable little two-year-old. 1) The book Healthy Sleep Habits, Happy Child saved our lives first. It got our son sleeping AT ALL and then sleeping on a predictable schedule, which we all desperately needed. After he was rested, we could finally start working on other things. 2) Sign language. We started signing before he was even 8 months old, and it helped immensely. Our son is very spirited and knows EXACTLY what he wants. It was absolutely crucial that we were able to communicate with him to figure out what he wanted. A) As I was pulling out of my postpartum depression, it was crucial that I reframe my thinking about my son. I loved the early chapter on using positive labels for our kids - determined instead of inflexible, curious rather than dragging his feet, spirited instead of hellish (yes, I did say that one), energetic instead of drives me crazy, and so forth. --"He will be a WONDERFUL adult. This trait is difficult to parent, but it will make a wonderful adult and friend later." --"This isn't a personal attack. He is overwhelmed with his intense emotions and needs me to teach him how to cope. He's not trying to punish me." --"My child is in a spillover tantrum. I don't need to go there, too." --"Stop and think, listen, talk to him. What part of his nature has just been threatened?" C) Feeling less alone was wonderful. I hate it when the old ladies nod their heads and are like, "Yes, kids are difficult," and smile. My grandmas said that until they were around my son for more than two hours straight. Then they said, "Oh my goodness, does he EVER stop moving? No wonder you have him in daycare! You would physically break down and have no energy left if you tried to follow him everywhere." I love reading this book and being like, "No, my kid isn't a freak. He's just more spirited and energetic than most people can imagine, so when they say those trite, idiotic phrases, I can just let it go. They are talking about a different kind of child. My child is like five of their children. I can let it go." All in all, I am SO GRATEFUL that the author wrote this book. It has really saved us. And now, as he is turning two years old, he is better than ever. I promise, it's possible! I LOVE my passionate, intense, loving, curious little guy! He reminds me of myself and his dad (we were both spirited children). Our beginning was absolute hell, but with good tools, including this book, he has gotten better and better. On good days, I can't imagine a more perfect, wonderful child. Mary is right - we ARE the lucky ones! I can't imagine having a dull, uninterested, passive child. Of course, on bad days, I want to drive to my parents' house and leave him there for a week. But we have tools now to work through it, and we're doing alright. Life is so much better now. Overall pretty good, fairly helpful. Loved the part where it talks about how those traits that make your child a little difficult at times are going to make them be very successful adults one day. It was a great reminder to carry on in patience and help them turn their weaknesses into strengths. I'm not alone! There are other sensitive children out there with parents who are struggling like I am. This book gave me some good ideas about how to approach situations with my son. I will be referring back to this one a lot. Lots of really useful examples, that can applied in every day life. This was SO insightful in helping me understand my spirited daughter. But this is not just good for spirited kids, I think it's great in understanding ANY kid, because one or more of the temperaments described here can apply to other children, who may not necessarily be "spirited". I wish I had read this when my kids were younger, and I probably could've saved myself from alot of tantrums (theirs AND mine!). They're now both elementary-aged, but this would've been SO helpful at the toddler/presc This was SO insightful in helping me understand my spirited daughter. But this is not just good for spirited kids, I think it's great in understanding ANY kid, because one or more of the temperaments described here can apply to other children, who may not necessarily be "spirited". I wish I had read this when my kids were younger, and I probably could've saved myself from alot of tantrums (theirs AND mine!). They're now both elementary-aged, but this would've been SO helpful at the toddler/preschool ages! I think my daughter falls into the lower range of what is considered a 'spirited child'. I've seen kids who are much MORE intense, energetic, defiant, than her, but she can give us quite a run! I've learned that my son is perceptive, and slow to adapt, and serious/analytical in his mood, even though he is not 'spirited', he does frustrate me, and this book has helped me understand him better. I learned alot about different temperaments...that they are not trying to drive me crazy, this is just how they interact with the world. The socks seams that my daughter has tantrums over aren't something I can just say 'get over it, just wear the socks', they REALLY bother her in a way that those who are less sensitive don't feel, she's not just trying to be difficult! But it's not just accepting it, it's teaching them to words to describe what they are feeling, and to move toward handling their own temperamental challenges. I loved how each temperament is described, analyzed, and suggestions given to address each one. Many things contribute to the difficulties of handling a spirited child, and it's great to be able to understand the root cause of them, not just try to change them through various discipline strategies. I love that this book doesn't label these kids as 'naughty' or 'bad', but points out that each of these different temperaments can be a positive trait, if nurtured and guided appropriately. This was encouraging, to see my child not as a 'difficult, stubborn, hyper' kid, but an enthusiastic leader that is full of energy! I also learned alot with the section on introverts and extroverts, and also how to deal with the various temperaments if the parent also shares the same temperament or has an opposite temperament. Sometimes tempers flare because we're so similar, and also, in other cases, it's because we just don't understand the other person. I liked also how there are chapters that deal with specific trouble spots-mealtime, holidays, sleeping, getting dressed, school, etc. This was very helpful, even though over the years, I've discovered many of the suggested ideas on my own, but it was encouraging to see that yes, this was the right direction for dealing with certain issues. I also liked that the author recognizes that the same things will NOT work with different kids, and I think that's what's lacking in many other parenting books. One size does not fit all! I also appreciated that she differentiates that some issues are beyond temperament, and are actually a medical issues (like ADHD, or sensory integration disorder, etc) that should be addressed professionally, and sometimes, it's a medical issue AND a temperamental issue. When I started this book, all I could think was - they have my kid pegged! It's kind of nice to know that I'm not the only one dealing with this kind of intensity and spirit in my child. I read the updated ed. (2015 I believe). I learned a lot of good techniques, although they're not all working... it is a constant battle. Forgot to mark this one "read" after my kindle loan ran out and I bought a hard copy to finish it. Gosh I should have read this book years ago. What wonderful insight into how your "spirited" child's brain works and what tools and techniques work in different situations. Wonderful book. 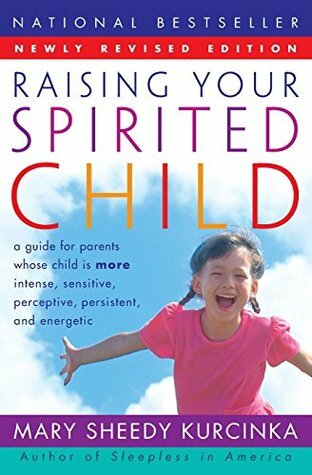 I think it would incredibly helpful even if your child is not "spirited". I have at least 2 highly spirited children (the jury's still out on the baby), and a friend recommended this book to me. It's saved her life and her marriage, apparently, and I can see why. "Highly spirited" is actually a thing which is frequently diagnosed as being ADHD or even mild autism. It's characterized by sleep issues, dramatic emotional highs and lows, and boundless energy. When my oldest, now 8, was a baby and toddler, I thought I was going to go insane dealing with him because of thes I have at least 2 highly spirited children (the jury's still out on the baby), and a friend recommended this book to me. It's saved her life and her marriage, apparently, and I can see why. "Highly spirited" is actually a thing which is frequently diagnosed as being ADHD or even mild autism. It's characterized by sleep issues, dramatic emotional highs and lows, and boundless energy. When my oldest, now 8, was a baby and toddler, I thought I was going to go insane dealing with him because of these things. He didn't sleep through the night until he was 4 YEARS old. I have spent hours at the park with him just to avoid the scene that would result if I tried to make him go home before he was ready. This book would have been supremely helpful back then, since it helps you figure out what the heck is wrong with your kid and reassures you that it's not something you did. Mary Sheedy Kurcinka is a best-selling author and internationally recognized lecturer and parent educator. Her books Raising Your Spirited Child, Raising Your Spirited Child Workbook; Kids, Parents, and Power Struggles; and Sleepless in America: Is Your Child Misbehaving or Missing Sleep have been translated into ten languages. As director of parentchildhelp.com, Mary provides training nationally Mary Sheedy Kurcinka is a best-selling author and internationally recognized lecturer and parent educator. Her books Raising Your Spirited Child, Raising Your Spirited Child Workbook; Kids, Parents, and Power Struggles; and Sleepless in America: Is Your Child Misbehaving or Missing Sleep have been translated into ten languages. As director of parentchildhelp.com, Mary provides training nationally and internationally for families and professionals, including medical personnel, educators, and social service providers who serve families. Licensed as a parent educator and early childhood teacher, she has pioneered efforts to bring topics such as temperament, neurobiology, the importance of sleep, and emotion coaching into homes, schools, medical practices, and businesses. She is as comfortable as a keynote speaker for major professional conferences as she is working one on one with families in their homes or teachers in their classrooms. Known for her real-life examples, Mary links research-based information with typical challenging behaviors and provides practical solutions that really work. Her presentations have helped hundreds of thousands of parents and professionals to understand children better, and themselves as well.